While this formulation still recalls a Far Eastern bazaar, and retains all of its musky, deeply sensual amber and tropical, vanilla-esque tonka bean flavors in their original proportions, the added presence of alcohol serves to lighten it up and give it some breathing space. In its newly diffused form, the fragrance is more noticeable to those in your direct vicinity. 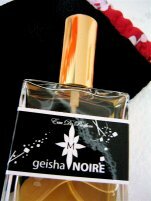 Geisha Noire Eau de Parfum comes with its own hand-sewn couture drawstring pouch, whose fabric is a richly textured solid black kimono-cloth crepe known as Chirimen. The colorful silk trim is made of precious strips of vintage kimono fabric. When not in use as a perfume cloak, this pouch doubles as a container for a cell phone (or one of many other of life¹s small necessities and luxuries). Wrap yourself in freshness! It's apple season and nothing smells sweeter or cleaner than fresh, green fruit... even better, these new products from Les Plaisirs Nature bring a harvest of natural fragrance to enjoy over and over again. I was really sad when Aroma M stopped selling the oils in the pretty stoppers. I absolutely cannot stand roller bottle oils – they always seem to clog slightly after a while. Glad Noire is an EDP now – I liked it a lot but found it a tad stifling with that big punch of amber it had in oil form. I don't like roller bottles at all, and for that matter, will take an EdP over an oil whenever I can get it. But didn't know they had stopped making those bottles — they really were gorgeous. So funny — I have the opposite reaction — perfume oils are so non-diffusive that I find them nearly pointless to wear. Ah well, so far as I know there are no plans to discontinue the oil.